About a month ago my baby started pulling to standing, which is wonderful and exciting. However, about two weeks ago she started standing in her crib immediately after I put her down for sleep. 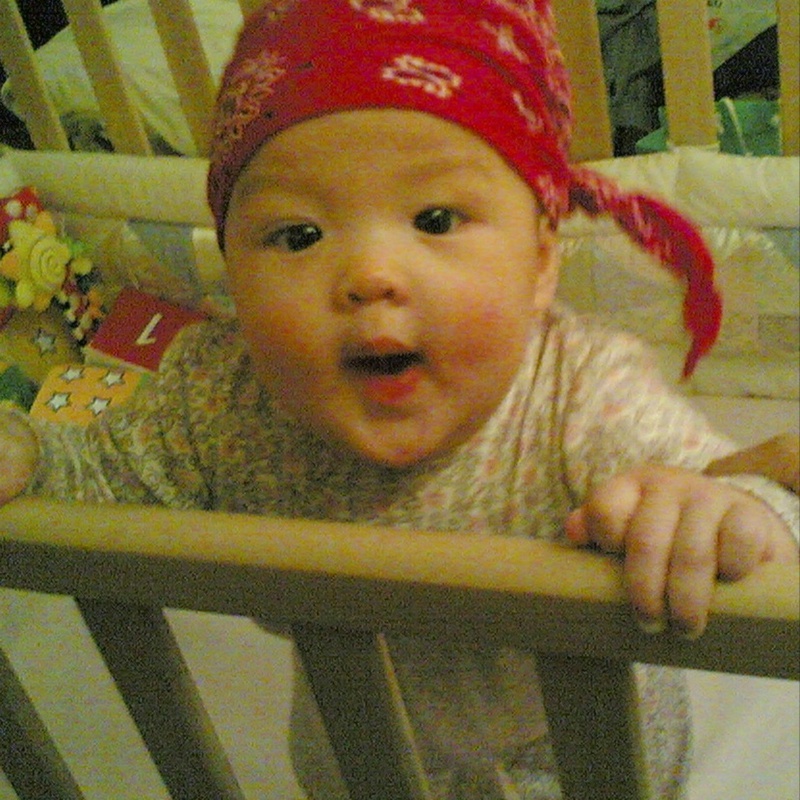 She holds onto the side of the crib and screams and cries. I’m not comfortable letting her cry like this for more than 20 minutes (which feels like an agonizingly long time), and so after giving her this time to work it out on her own I typically return to her, try to soothe her, and then put her back in the crib for a second try at the nap or bedtime. Unfortunately this rarely works, and as a result she’s now skipping naps and getting progressively fussy and over-tired throughout the day. Prior to this standing-in-the-crib problem, she had developed solid, predictable sleep habits and it didn’t take more than 10 minutes for her to fall asleep. I’m making a point to give my baby lots of time to stand up and move freely during the day, and I’m sure this will resolve with time, but is there anything I can do to help her now? Good news. Your child has developed healthy sleep habits and will get back to them as soon as she integrates this new skill into her repertoire. You are doing the exact right thing. You go in and acknowledge what you see, “You are standing. It is time to lie down and sleep.” Help her out and then leave the room and wait. I encourage parents to give what I call one cycle of crying, which is exactly 21 minutes. In that time if you hear what I call cycling, in that the cry goes up and down and has some breaks in it, this is the sound of the brain soothing itself, and this is struggle. Struggle is O,K, and part of all development. If during this time the cry winds down, do not go in. If you do, it can start the cycle all over again. If the cry winds up and sits at a high level, this is suffering, and you can go in and repeat what you see and that it is time for nap. The most important thing for the parent is to bring an attitude of confidence to the crib. You know she can sleep, and you can remind her that she will sleep again. Assure her that she can sit down and return to sleep. My daughter did this same thing. I thought I had sleep conquered. I was downright arrogant about it. I had just started developing my sleep program, and it was the best thing that could have happened to me. It was very humbling. My favorite part of parenting is how humbling it is. But I freaked. I thought, no, this can’t be happening. It took her five days. And to this day what I believe turned it around, and what turns it around for the many parents who call me with the same issue, is our attitude. When a parent looks at their child with confidence and belief that the child is capable of handling their own development and the struggle that comes with it…it is very powerful. I promise she will get through this. She has a solid foundation to return to thanks to your efforts in this area of sleep. Simply remind her with confidence that she can. This is such great info, thank you! My son does this “cycle cry” a lot! I always thought, he was just tired of crying and needed breaks. Then when he was sick, he really cried. After that we know what the suffering cry is. He’s been pulling up to stand for a while now, and still does it, but now he will dance in his crib through a whole nap. What if the baby doesn’t go back to sleep after one struggle cycle? Do you let her go through another one? My daughter did this as well. As I was letting her go through the cycle she somehow pulled herself up on the side of the crib and toppled over… the side was as low as possible. She did have bare feet and very strong arms! This was such a surprise! I meant to say the mattress was as low as possible. The side was as high as possible! This is really good advice, Lucinda. Thanks! I find myself sometimes agreeing and sometimes disagreeing with the RIE philosophies, especially as my second son has some special needs that make some typical “parenting advice” laughable. I am not practicing RIE, just interested. I completely disagree with letting your baby cry alone in a crib (for more than a minute or two while you make your way to the room or use the bathroom for instance). Babies cry to express a need. If your attention, comfort, companionship is that need, so be it. Why do some philosophies feel the need for a baby to have independence (or to settle down on his/her own) trumps these other needs? I say, go to your baby. I feel connection with your child is the important thing here. Not letting bed time be a scary thing in a dark room they have to learn how to do alone. Plus, don’t forget to check the basics (diapers, hunger, burp, safety). Rebecca, I appreciate you sharing your opinion…it’s always welcome here! And I understand where you are coming from on this issue. I agree that babies cry to express thoughts and feelings, but I don’t agree that every cry is an expression of intense need. A baby will cry when a parent leaves her with a grandparent or other caregiver, even a dad (especially at Katie’s baby’s age), because she objects to her favorite person leaving, and it doesn’t mean she feels traumatized and abandoned. A baby cries when we must take an inappropriate object out of her hands, but that doesn’t mean we should change our mind and give it to her. Babies cry to express a range of feelings; they don’t have another way to express subtleties. They cry when they are half-awake and struggling to ease themselves back to sleep, and if we disrupt that process, come and wake them up, they have to start again from scratch. 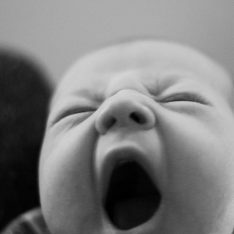 The ability to fall asleep and return to sleep is a gift that we can help babies attain and retain. Babies in my class who for weeks have appeared to be needy, fragile and frazzled, incapable of playing and enjoying themselves for more than a few minutes at a time will suddenly metamorphosize into calm, centered, focused, joyful explorers with long attention spans when their parents commit to helping them sleep better (which usually means allowing them to express some unhappiness at bedtime). No one could convince me that those children have been harmed in any way. In fact, it seems as if they are finally able to be fully present and engage in life. I could NEVER imagine leaving a child at bedtime to “CIO” (and I still don’t really understand the expression. What is being cried out?) The key, in my opinion, is to try to understand our baby’s cries and not have the knee-jerk reaction most of us have…to do everything in our power to make the crying stop. To me, that is “connection with your child” — truly understanding her and what she is working so hard to express. By the way, for what it’s worth, Magda Gerber began her work in the United States with infants and toddlers with special needs. Your comment inspired me to resubmit my original comment that somehow got lost in cyberspace! I think it can be enormously reassuring to parents to understand that even a baby who has previously been a “good” sleeper may have difficulty falling asleep when struggling to master physical milestones. Maintaining a consistent routine, having a positive attitude, careful listening, and allowing some time for the baby to settle on their own, are all respectful ways to support a baby who is struggling to find her way to peaceful sleep without taking over the process, and possibly causing problems that didn’t exist before. A baby who has developed good sleep habits will return to their previous sleep patterns (usually within a few weeks at most) once they are no longer in a hyper-aroused state caused by their brain and body being unable or unwilling to rest because the drive to master new physical skills is so great. Some other things that can support a baby in relaxing during times when sleep doesn’t come easily include adding a warm bath and gentle massage to the bedtime routine, spending extra time outdoors during the day, and (believe it or not) extra early bedtimes during these phases. As Lucinda pointed out, safety is so important, and I generally guide parents to take extra precautions as their baby becomes more mobile. In addition, I recommend video monitors for parents who are very anxious about safety. I understand that 21 minutes is a long time to listen to a baby struggle, and many parents are unable to listen to a baby cry for this long even if they know their baby is not suffering. I generally suggest parents check on baby every ten minutes or so. This allows the baby time to settle on his own, without leaving the baby alone in their struggle. The guidelines I give for comforting are to keep lights off, to move and speak slowly, quietly and minimally, and to comfort without removing the baby from the crib. Sometimes singing a particular lullaby, saying the same comforting phrases, and/or some gentle caressing will help a baby to calm. But I let parents know that the possibility exists that their loving ministrations may further arouse the baby and/or interrupt her process of self soothing, which could lead to more crying. Yet, there are times when a particular baby may require and benefit from more presence and soothing from a parent before sleep. Why is it so important that a baby have the opportunity to self soothe? Because going to sleep, staying asleep, and returning to sleep after one of the many mini-wakings that occur during the night for both babies and adults, is a learned behavior. If a baby does not have the opportunity to discover how to self soothe, the very real possibility exists that the baby will turn into a child who will turn into an adult who constantly struggles with sleep difficulties, and never internalizes sound sleep habits, or learns how to self comfort. Every single human being has to go through the process of “learning” to self comfort in order to fall asleep and stay asleep, and the later this learning process begins, the harder it is to break bad habits that may have developed, and the more struggle that ensues. Isn’t it kinder and more respectful to help our babies develop good habits from the beginning, supporting and building on their innate capabilities, rather than waiting until some random day when we deem them suddenly capable, or worse yet, ensuring their continued reliance on someone or something else to “put” them to sleep? Eileen, I’m very curious about the 21 minute sleep cycle, since this is the first post where I’ve read about it. Where can I read more? When we’ve worked towards establishing good sleeping habits, I’ve just been listening to the sound of the cries — but recently when I go in (and don’t breastfeed), it just seems to make everything worse and take that much longer for him to settle. But I can’t stand the thought of him crying in there too long by himself. 21 minutes is outside of my comfort zone unless I understand why. This is going to be coming soon in our household, I just know it. Our 7-month old son is starting to pull up to a stand and he’s extremely active. I’ve already thought how much trouble we are in for once he can stand up in the crib. To be honest, I’m a little fearful that he’ll be able to pull himself right over the side. Is this possible with the crib mattress set at the lowest level? I printed out the post so I know where to find it when I need it before long. Hi Samantha! Although anything’s possible, it’s not probable that he’ll be able to climb out if the mattress is set at the lowest level. Make sure there is nothing in or attached to the crib that he can use as a foothold (i.e., firm bumpers). hi janet, thank you for replying to my previous concern (toilet training). I will keep that in mind. Anyway,another problem with my 1 year 11 month-old son is his sleeping habits. At night, there is no fuss no going to sleep on the bed. But during the afternoon naps, he turns rebellious. I usually start by lying with him on our bed and reading him books. But after a while, he gets bored and wants to get out of the room to play. I will tell him gently that its time for him to take his nap. But he will cry more. Then I will put him in his crib (just beside our bed) and leave. He cries continuously for about 10-20 mins. After about 20-30 minutes, he usually goes to sleep by himself. but there are plenty of times that he wont. I would like to ask your opinion on how to develop a way that I would not have to put him in his crib and leave him while he cries. It breaks my heart. Im afraid that if I always do that, he might get traumatized and think of his crib as a “time out”. Thank you so much. We bedshare with our 8 month old (as a working mom it helps with breastfeeding, we have a king we don’t mind 🙂 ) however as I am paying to attention to my baby as a person, not just ‘the baby’ I see that she sleeps better when she was more space, so we are going to side car her crib so she can have her own space to roll around. I have a 16 month old who has not developed good sleep habits and fights sleep intensely. When she is left to cry standing in her crib the mucus produced by her sobbing causes diarreah and even vomiting. How can I help her calm herself and learn to sleep on her own? I’m going through this exact situation. I found the info very helpful but wanted to hear the nap situation addressed more clearly. after a 21 minute cycle of escalating crying, do we skip the nap and return to our daytime activities? and if this is the case, I’ve always heard that the less a baby naps, the worse the nighttime sleeping will be. is that something to worry about? Ugh. should I just follow my babies lead and stop over thinking everything?? We are going through the same issue. 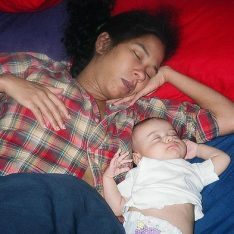 My baby has been always a bad sleeper and we did not want to do CIO. However, at 7 months,the situation got so bad that he was waking up 7-9 times a night and wanted to nurse to sleep every time. He and I were both miserable in the morning so we went to CIO. We were surprised how quickly he learned to soothe himself to sleep (without crying too much)and started sleeping through the night (waking up once or twice but falling asleep within a minute). But, the trouble came back at 9 months when he just stands there for 30 minutes until we pick him up. He is def. cycling (crying loudly,then being quiet and then starting again) but it does not stop after 21 minutes. Do I let him cry for an hour until he gets tired? I feel bad doing that. What do I do after 21 minutes have passed? Thanks for any advice you may have. (So far we picked him up if he cries more than 25 minutes. Then he nurses back to sleep and we put him back in his crib.) Thank you again for any tips. I was looking for exactly this article — thank you. I think my baby was having a hard time soothing herself because of teething and the stimulus of being able to crawl and pull up. But, just because it was a struggle for her does not mean I should abandon her potential to soothe herself — it just takes a few minutes longer during this transition. When I finally realized I was getting in the way, she was asleep in no time. Well, 6 minutes to be exact. We have 7yr, 6yr & 11month old sons. We are currently building a home, consequently we are renting a 2 bedroom home so all 3 boys share a room. I practice the 21min cry cycle during the day and he now settles quite well. However at night I can’t risk his crying waking the older two. He currently wakes every 3-4 hours. How can I get him to self settle without waking his brothers? Thank you for this post. It is so helpful! In my situation, my little one will stand up and hold on to the side of the crib and will start crying -suffering crying, escalating. When I go in he seems so distraught he doesn’t seem to be able to listen to me and his crying doesn’t get any better. I have to physically help him get down.. And then he gets right back up again. Any thoughts? Our son is going through this right now. He is nearly one-year-old. The only thing I found has helped is getting his father involved in the bedtime routine. Once I nurse him and place him in the crib, he nearly 98% of the time wakes immediately and begins to cruise his crib and stand. My husband then places him back down on his back and begins to rub his back. This take place 10+ times until my son finally begins to settle. He rubs his back for 10-15 minutes (sometimes more), something my son will not allow me to do as he again attempts to stand several times! This is the only solution we have found though it still takes 20+ minutes.